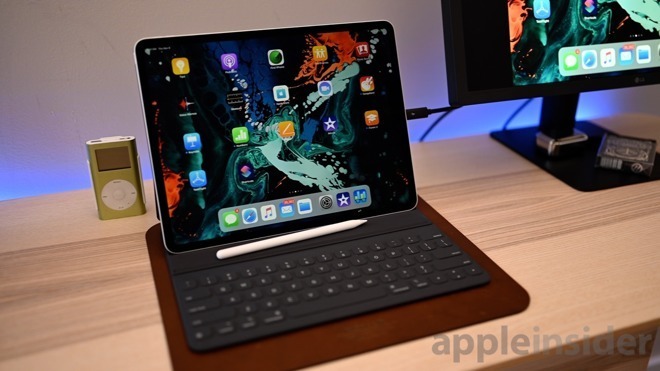 Expressing difficulty in acquiring data on the new iPad models, Troughton-Smith posted on Twitter "It seems like both iPad sizes support a Smart Keyboard and Pencil." While the iPad has included support for the Apple Pencil since 2018, the Smart Keyboard would be a new element to the product line. In the same tweet, Troughton-Smith muses on data raised last week from the latest beta of iOS 12.2, in that they would continue to use Touch ID and not switch to Face ID, an authentication method used on current-generation iPhones and the iPad Pro. He tweets "it's possible that neither include Touch ID (nor Face ID)," before adding it would be hard to imagine Apple shipping without Touch ID unless it was to do with cost or another financial benefit. In a followup tweet, Troughton-Smith warns "Not 100$ sure on any of this other than the model identifiers, so don't take that as confirmation of anything." Here’s to hoping for a track pad. would be nice, but I doubt it. Apple's been very consistent with keeping iOS as a touchscreen platform and a trackpad would muddy the picture. I'm sure they consider the pencil to be the preferred input device (after your finger). Although on the phones, the “trackpad” or “pointer” function appears during typing when you hold down the space bar on the keyboard. They could always work within those parameters and make the trackpad function only work during typing or in apps which support it... even though that would amount to a very spotty user experience. Except that when used with a keyboard the screen is vertical and no different than a laptop. And if its stupid to use a finger on a Surface, it's still stupid to use a finger on an iPad Pro. Agree, make better ergonomic sense when using the keyboard. Apple won’t do it though as the then they would need a new keyboard for the larger iPad pros too. And then demand for mouse support and other peripherals would escalate too. iOS + keyboard + trackpad = Arm based Macbook. Maybe even MacOS for a little more fun! "It's possible that neither include Touch ID (nor Face ID)"
I don’t see why Apple couldn’t use the Pro form factor for standard iPad and return to the old days of a pass code for security (if required). I’m guessing most iPads are used in the home and security isn’t such a big deal. ipad Mini Pro would make my day! Still, iPad mini, budget iPad update, maybe iPod update, not enough for an Apple event, just new products released, as none are “flagship” devices. So why would Apple have a Spring event? Are they ready to introduce the new Mac Pro? If so, this would justify an event, and they could start out with all the smaller updates to work up to this. Or, is their not an iPod, but, some sort of new gaming device? This would justify event. Or something new in the services department...but, that seems to be off into Q3 (TV). The iPad has a serious problem in iOS that prevents it from being a serious desktop replacement: spellchecking. On Windows or Linux, you can spellcheck from the keyboard by invoking the context menu key or SHIFT-F10. On macOS, on first party text editing apps that use the Cocoa spell checking API, you can move your keyboard cursor over a misspelled word and choose among possible corrections using only the keyboard. On iOS, no such functionality exists. On an iPad with a keyboard plugged in, you need to reach for the screen in order to choose corrections. I've tried the macOS solution described above and it doesn't work on iOS. On an iPhone it doesn't make a different since your fingers are already on the screen. For serious writers this is a problem, and it's a very simple one for Apple to solve with an iOS update by for whatever reason they haven't thus far.